Exams » RRB (Railways) » RRB Group D Admit Card 2018 For CBT Released @ rrb.gov.in, Download Now! RRB Group D Admit Card 2018 | The Railway Recruitment Board (RRB) has activated download link for RRB Group D Admit Card 2018 for the first stage of the recruitment process, the Computer Based Test (CBT). RRB Group D Computer Based Test is going to start on 17th September 2018. Candidates will have to login to their account suing their Registration Number and Date of Birth to download their RRB Group D Call Letter. Important: Candidates will be able to download their RRB Group D Hall Ticket 4 days prior to their exam date. After completion of the application procedure, the RRB Board activates the RRB Group D Admit Card Download link. Candidates need to be ready with login ID and Password to download RRB Railway Group D Call Letter. RRB Group D Admit Card is a document of utmost importance that candidates must carry with them to their center of examination. Without RRB Group D Hall Ticket, the candidate will not be permitted to sit in the online/offline examination. 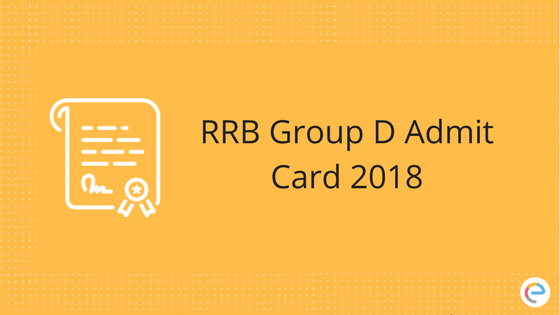 In this article, we will be providing you the complete details about RRB Group D Admit Card 2018. RRB has activated the RRB Group D Mock CBT Link where you can take the test and see how the test interface works. Step 1 Log on to the Railways official website, i.e., www.rrb.gov.in. Step 2 Click on “Other RRBs” and select the RRB Region you have applied for. Step 3 Click on the link provided to download your RRB Group D Admit Card. Step 4 RRB Group D Online Exam Admit Card 2018 Login Page will be displayed on the screen. Step 5 Enter your Registration Number and the DOB/Password in the specified fields. Step 6 Later, click on “Login” Button. Step 7 Finally, your RRB Group D Admit Card 2018 will appear on the screen. Step 8 Download RRB Exam call letter 2018 PDF. Step 9 Take a print of RRB Hall ticket for reference purpose. The candidates who will be selected in the final merit list will be able to join from the next year. The admit card of Railway Group D posts will be uploaded on the regional websites of RRB. Candidates can download them from the official website of the board where they have applied. We hope that this detailed article on RRB Group D Admit Card helps you. If you face any issues concerning the RRB Group D Admit Card or any aspect of the exam in general, drop your query in the comments section below. We will get back to you at the earliest. Kamran, ALP group D admit card will release next month. Please contact the official authority. Hey Nagendra, please keep an eye on the official website. It will be released soon. Hey Niraj, it will be released soon. Raviteja, it will be released soon. We will update it here when it is released. kaise hoga abhi tak koi sunwai nahi hui h………. Hey Vipin, it is likely to start in the month of September. When in the month of September, Sir? Hi ,sir/mam….mera ghor guwahati me hai .main chennai me job kr t hoon.but ek problem hai ki mujhe exam done k lie guwahati jana porega. Please help me ki chennai se exam de sakti hoon yeah nhi. RRB Group D admit card kab tak aayega 12.08.2018 ko exam hai abhi tak pata chala hai exam kab hai mera ….plwase sir kindly request you mera name -P HEMANTA KUMAR RAO hai letter wise mera exam kab hai sir please boliye and RRB admit card link bhi sie pleasse sir…. Sir, while entering registration number it is taking 9 digits only it is not accepting last digit please Help out. ADMIT CARD ABHI TAK NHI AYA? Sir ji group D ka admit card kab tak aayega…please answer me,…. Hey Amar, it will be released soon. Keep an eye n the official website. Hey Sarat, the admit card hasn’t been released yet. It will be released soon. Keep an eye on the official website. Hey Ashwani, the admit cards will be released soon. Hey, the admit card hasn’t been released yet. Hey Mahedra, RRB hasn’t released the admit card for RRB Group D yet. The admit card hasn’t been released yet, Anupam. Don’t worry about it. Just keep an eye on the official website and focus on your preparation. Photo reupload has been closed. दिखा रहा है. इस का क्या मतलब है.?? Nikesh sir as I told u that we had to reupload our photo becoz of that photo was not clear for administration. And for the same the last date was 30th July. Now we are not able for the exam. Regarding this I asked my other friend they said same. Now next time best of luck. I am from Kolkata and as per schedule my RRB-Group-D exam is on 12th Aug 2018. But still now I’m not being able to get my Admit card online. So, can you please help me out in this regards?? Please check your email – the one that you used during registration. It is not sure. RRB Group D exam date is not fixed. Hey, keep an eye on the official website. It will be released soon. Navya, the call letters have not been released yet for Group D.
Hey Akhil, the call letters / admit cards will be released soon. Please keep an eye on the official website. Hey Nilesh, which exam are you referring to? If it is RRB ALP exam, then you will get your admit card 4 days prior to the exam. As for Group D, the admit card hasn’t been released yet. Keep an eye on the official website. It will be released soon. Aditya, the RRB Group D Admit Cards will be released soon. Hey Raju, RRB Group D Hall Ticket has not been released yet. RRB Group D ka admit card kab tak aayega ? aj 09.08.2018 ho gyi kaise hoga sir please kuch to btao. how to download the admit card its not taking the registration no. When will get rrb group d admit card 2018?but still now I can’t able to downlaod . Question karne pr bs ek hi answer ” it will be released soon. Hey Sultan, it’s not yet declared. Probably, it will be held in September. Hey, please keep an eye on the official website. The admit card will be released soon. Do not panic. Focus on your preparation. Hey, the admit card is not released yet. Please keep an eye on the official website. Hey, the exam will probably be conducted in September. Admit Cards will be released before that. Please keep an eye on the official website. Hey, Group D exam is likely to be conducted in September. Admit Card will be released before that. Hey, the exam will be conducted in September in all possibility. Before that the admit cards will be released. You will get all the information there. Hey, the exam will probably be conducted in September. Admit Cards are likely to be released by the end of this month. Hey Aruna, Group D exam is likely to be conducted in the month of September. Admit cards will probably come out by the end of this month. hey, the admit card will be released soon. RRB has released a notification saying that the exam is likely to begin from 17th September. He Akash, the exam is likely to start from 17th September. Keep an eye on the official website for Admit Card and other information. Hey Sanjay, it will come probably by the end of this month. Keep an eye on the official website. Hey Narendar, please keep an eye on the official website. The Admit Card is likely to be released at the end of this month. Exam will probably be held in September. Please check your registered mail ID. Hey Rahul, the Admit Card for Group D hasn’t been released yet. It will be released soon. Keep an eye on the official website. Hey Nilesh, the exam is likely to be conducted in September. The admit cards will be released before that, probably at the end of August. Hey Mukesh, the exam is likely to be conducted in September. The Admit Card will be released before that. It has not been released yet. Hey Vijay, the 9 digit Registration Number is for RRB ALP. For Group D, the Admit Card is not released yet. When it is released, you will be able to enter the 10 digit Registration Number. Hey, admit card for Group D has not been released yet. Keep an eye on the official website. It will be released soon. Hey Kulwinder, the exam is likely to be held in September. The admit card hasn’t been released yet. It will be released soon. Keep an eye on the official website. Hey Ramesh, it will probably released by the end of this month. Krishna, the exam is likely to be conducted in September. The Admit Card will be released before that. Keep an eye on the official website. RRB Group D admit card kab tak ayega 18-08-2018 ko exam hai abhi tak nahi aya . Hey Rohit, the exam is likely to begin from 17th September. hall Tickets will be released before that. Hey, keep an eye on the official website. It will probably be released by the end of August. indianrailways.gov.in – that’s the official website. sir admit card kab ayega exam nikal gaya to….. Probably by the end of August, Deepak. Hey Nabjit, the exam is likely to be conducted in September-October. So, the Admit Card will probably be released by the end of August. Hey, Group D Admit Card is not released yet. It will probably be released by the end of this month. Hey, the exam is likely to be conducted in September-October. dates will be released soon. Hey, the exam is likely to be conducted in September. The admit card hasn’t been released yet. Hey, the 9 digit registration number is for RRB ALP. RRB Group D Admit Card has not been released yet. The admit card will probably be issued by the end of this month. Keep an eye on the official website. Hey, the Group D exam dates will be released soon. Please keep an eye on the official website. When admit card will release? Hey, probably by the end of this month. When RRB group d admit card will be released. Hey Sneha, the exam is probably going to start from 17th September. Admit Cards will be released before that. Keep an eye on the official website. Hey, the admit card is not released yet. It will probably be released by the end of August. Exam will be conducted in September-October. Hey Bhupan, it will probably be held in September-October. Hey, the exam will definitely be held, probably in September-October. The admit card will be released probably by the end of August. Hey, it will come probably by the end of August. Hey, the admit card has not been released yet. It will probably be released by the end of August. Hey Ashish, the admit card is not released yet. Hey Danish, the admit card is not released yet. Hey Sandeep, exam is likely to be conducted next month. The admit card will be released before that. Please keep an eye on the official website. Hey Ashish, the admit card is not released yet. It will probably be released by the end of this month. SIR, Photo reupload nahi kar paye, to exam de sakte hai ? sir….ji kb ha RRB ka exam koi date fix nhi hua kiya abe tk…..any information….latest….so give me..plz…..
Hey Poonam, as per the latest notification, the exam will probably begin on 17th September. Please keep an eye on the official website. Hey, as per the latest notification, the exam will begin from 17th September 2018. Admit Cards will be released before that. Laxman, the exam is likely to start on 17th September. Keep an eye on the official website. Yes Nagendra, the last date to upload photo is over. Hey Ajay, the admit card will be released soon. Keep an eye on the official website. Hey Babul, the Admit card is not released yet. Keep an eye on the official website. Somu, keep an eye on the official website. The Admit Card will be released soon. The last date to re-upload photo is over, Dharam. Very soon, Babul. Theexam is likely to begin on 17th September. The admit cards will be released before that. The exam is supposed to begin on 17th September. Please keep an eye on the official website to know when the admit card will be released. You will get to know the date then. Please keep an eye on the official website. It will be released soon. Sir RRB group d ka exam kb se h hamesa alag alag date aaa rhi ghuma fira kr ab 17 september se h hoga bhi ki nhi 7 ko admit card aa rha tha o bhi kisi website pr lonch nhi huva bas bahana bana bana ke koi na koi new news dikhaya jaa rha hai please koii to link dijiye sir admit card download krn ke liye. RRB Group D ka admit card kab download hoga . Hey, admit card will be made available on 13th September. You will be able to download your admit card four days before the date of your exam. Please check the inbox of your registered mail ID or phone number. It should be there. Yes, you can use your email. Hey, Admit Card download link will be activated on 13th September. Please check the inbox of your registered mail ID or mobile number for the correct Registration Number and try again. Please check the inbox of your registered mail ID or phone number. Hey, when is your exam? You will be able to download your admit card four days before that from the official website. Hey, admit cards are released four days before the date of the exam for a particular candidate. Please check the inbox of your registered email ID or phone number. It will be there. Hey Chandan, when is your exam? You will be able to download your admit card only four days before the exam. Hey Suresh, how may I help you? It’s not released yet, Prakash. Hello, my exam is scheduled on 26th september but when in downloaded the call letter it only said name, place of exam etc, but not the centre and its code, and no photo and no signature. It also said that this intimation does not allow you to appear in examination. its just ike a exam information. HOW DO I GET MY ADMIT CARD? Hey, what problem are you facing? Check the inbox of your registered email ID or mobile number. Please check your online application form if you have saved it. Sir rrb me pure questions chudana anivarya hi kya . 100 ke 100 question chudana hi ki nahi. Pls answer thank you. I am resident of kolkata. Given me examination sit on Bhubaneswar . Can you provide me examination sit in Kolkata. Hey Samrat, we are not the official authority. Computer based test – Exam city & date intimation has been downloaded but there is no Exam centre and code mentioned in this intimation. Kindly provide Exam centre and code as earlier. Hi sir my exam miss due some reason. Can you give me one more chance. Sorry to hear that Rajesh, But we cannot help you regarding this since we are not the official authority. We can only say that you prepare for some other exam or this exam and write next time. You can Follow the steps mentioned above in the article and can download the admit card with ease. The admit card release date is September 13th, 2018. Hi Vishal, admit card date is released on Sept 13th, 2018. Please revert with the detailed query. Please contact the conducting body for a solution.